Cabinets, for use in a kitchen, are assembled in the shape of a box, with the width of the cabinet based on the available area of the wall. The frame of the cabinets consists of two side sections and a back, top and bottom section. Once the basic frame of the cabinet has been assembled the face of the cabinet can be added to complete the construction. Kitchen cabinets are constructed from various types of wood. Choose the type of wood that you want to use for your cabinet. Wood choices include pine, cherry, oak and walnut. You also can use laminated particle board. Measure your kitchen for the dimensions of the cabinets with a tape measure. 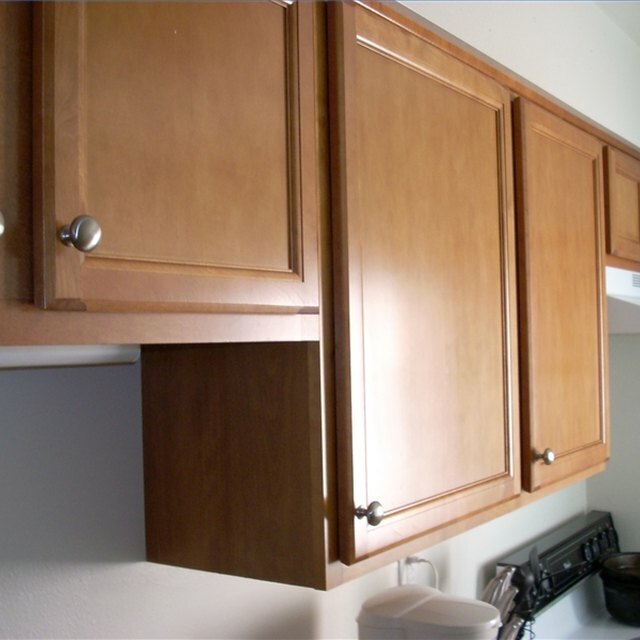 Determine the length of the cabinets on the wall, their depth and the height. Typical upper cabinets will measure 12 inches deep and 30 inches high. Their length will vary depending on the length of the wall, such as 36 inches. Measure and mark the wood boards to the size that you need for the cabinet with the tape measure and the pencil. Two pieces will need to be 12 inches by 36 inches for the top and bottom. Two more pieces will need to be 12 inches by 30 inches for the sides. A third piece will need to be 30 inches by 36 inches that will be used for the back. Cut the wood boards you measured and marked in Step 3 with the table saw. Place the four 12 inch wide pieces that you cut in Step 3 together to form the shape of a box. Drill three pilot holes ink each corner with the power drill. Apply a bead of wood glue to the top and bottom of the two side pieces. Set the top and bottom pieces in place on the glue. Secure the pieces of wood together with wood screws using the power drill. Apply wood glue around the edge of the box and then set the piece of wood that was cut for the back on top. Secure the wood with finish nails using the nail gun. Drive a nail every four inches around the perimeter of the frame. Measure and cut the ¾-inch by 2-inch boards for the face of the cabinet. Two boards will need to be 36 inches and three boards will need to be 26 inches. Place the two 36-inch boards on the top and bottom of the front of the cabinet and secure them with finish nails. Place two of the 26-inch boards on the ends of the cabinet and secure them with the finish nails. Measure and mark the center of the cabinet with the tape measure on the top and bottom of the front face. Place the last 26-inch board in the center of the cabinet and secure it with the finish nails. Measure the back of a cabinet door from top to bottom on one edge. Make a mark with the pencil for the placement of the hinges. Place the top of each hinge on the mark and secure them with screws using the power drill. Align the door so that the top is centered with the door opening. Secure the hinges to the inside of the cabinet with the screws. Repeat steps 12 and 13 for the other door. Cabinet doors come in many styles that you can use for your cabinets. Cover the nail holes and screws holes with wood putty and a putty knife. The handle can be attached to the doors once the cabinets have been secured to the wall.